Players can expect a bevy of free and paid content following the release of Total War: Rome II. Creative Assembly, the developer behind the Total War series and the soon to be released Total War: Rome 2, has announced its plans to create a variety of extra free and extra content for players to enjoy following the game's launch. The first free bits of DLC are already lined up. Players who pre-order the game, for instance, will be able to download the Greek States Culture Pack as well as the Pontus faction at the game's launch. Players can expect DLC well beyond what's included in the game's pre-order bonuses, however. Creative Assembly already has plans for multiple Culture Packs that will add more factions and units. Feature Packs, which will bring gameplay and aesthetic changes, and story-centric campaign expansions are also in the works. By October, for instance, players will have access to the free Seleucid Empire Faction, as well as the Nomadic Tribes Culture Pack as DLC. 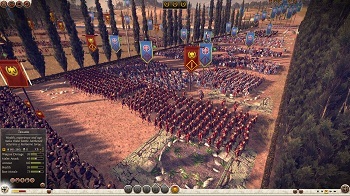 Creative Assembly also plans to work hard on fully optimizing Rome 2 after it hits stores. "We will continually improve the game's compatibility, optimization and integral features such as AI and gameplay balancing post-release, and plan to add to that with new control schemes and additional free formats on other operating systems," said James Russell, the game's lead designer. Russel also talked about plans to support the modding community. "Shogun 2 is our most moddable Total War to date with over 500 user-made mods on Steam Workshop alone. We hope to support ROME 2 in a similar fashion." Total War: Rome 2 will release on September 3rd.